"Support Comes in Many Forms." Most women go through hell trying to find an affordable, good fitting sports bra. They usually end up working out in something average, at best. Wearing the wrong support, or no support at all, can cause great discomfort, pain, and create bruises/sores, and not to mention, can hinder workout effort levels. So finding the right sports bra is essential. That's why we spent the past few months searching the market for the prefect sports bra– something that provides these 2 basic needs: functionality and affordability. While we didn't quite know what to expect from our search, truth be told, finding this combination was pretty easy! However, what we did realize was that while you can find a functional, affordable sports bra if you're an A cup, it gets a lot more difficult if you're a full B or larger....!?! Now before we let you in on our great finds, we took a look at the two most popular bras in the market that were within our price range. Here's what we found out about their fits. Under Amour's Mid Bra ($24.99) has been around for years. Its had a few face lifts and colors added, but what we found is that this bra is very shallow across the chest. Meaning, for those of us packing up top this bra may not provide support for mid to high impact movements. However, this bra is perfect for those with a narrow cross chest and smaller cups. The Nike Pro Bra ($30.00-$35.00)followed. This bra looked fun on, especially in it wonderful prints, however its bottom band fit was inconsistent and, because it's not encased in each iteration, it caused us some chafing along our rib cage. Both of these bras are gems to those who fit them well however, just to clarity we are searching for an affordable bra for ALL size women who want to do mid to slightly high impact exercises. Then we came across something wonderful! But before we give you the good news we have to drop a bomb on you first. We wanted to highlight the original VSX Player Open Back Bra but it's no longer available. Victoria Secret Sport has transitioned from the open back supplex to a high shine lightweight fabric racer back. It was a great bra for ALL sizes, any impact, and was only $32.00! The cross back is still available however, we don't believe it has the same support. But like we promised we found, not only one amazing supportive sports bra for under $50.00, but we found 2...And they are in stock!! The adidas Supernova Infinite Series is a high impact bra for only $40.00. Great for runs of any distance and pace, it has ventilated climacool that keeps you cool and comfortable. We did notices it can give your bust a lift, as that may not be a bad thing, however for some us we like to keep the girls concealed a little bit better we have to keep a tank handy. 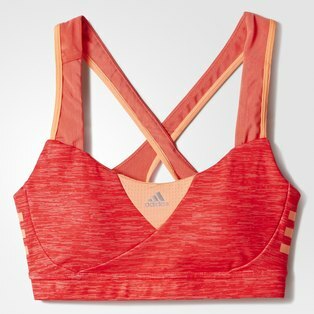 adidas also offers a medium-impact bra, Techfit Bra, for only $25.00. Its made for workouts like riding the elliptical or taking a brisk hike. It comes in great patterns and colors. Its not a high impact bra so while its great for running, depending on cup size it would be challenging to wear this bra for high impact activities. This bra is one of our favorites. It has the perfect amount of coverage, support, and its aesthetically appealing. While it may not be the best run bra, we did find that it worked best over all in terms of functionality and affordability. Bras will always be a big deal. With the change of designs, seasons, and styles we believe the quest will never end. If you find a sports bra that you love and that loves you back we advise you to buy in bulk. With the uncertainty of companies using the same fabric, using the same factory, and just rolling out the same designs is not guarantee. Our finds are exactly that, our finds. We'd love to hear about your fav sports bra to workout in and why? Also if you feel we've missed a bra that's amazing, please shoot us over an email at info@allyloveblog.com or leave us a comment below and we will be sure to order and wear test it and add to this article. We truly believe in the power of finding a brand who gets that all women are different and take that into account when designing product–without charging a cup tax. All of these finds and opinions are based on ALB's wear test feedback and research.